Do your customers take photos of your food and share them on social media? They can help to bring more customers into your restaurant. So how can you help them do this? 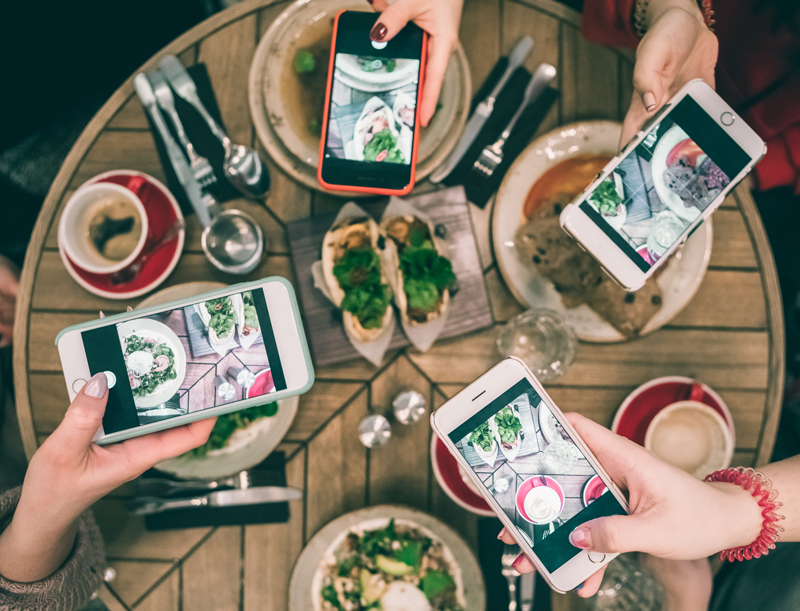 Restaurant patrons love sharing their food – not just with each other, but also with their friends, colleagues and relatives on Facebook, Instagram and Snapchat. Showing off on social media about the food that you have ordered is how people demonstrate their good taste. Taking ‘selfies’ is how your customers show the world what a good time they are having. If you play your cards right, you can share this publicity and convert it into new business for your restaurant. How can you make it easier for your customers to share their experiences in your restaurant and bring you more customers? Get your restaurant onto social media – it’s free to open a Facebook page or Instagram account. Pick the platform that suits your profile – Facebook today is for older customers and Instagram is for those under 30. Make sure that every dish that leaves your kitchen is presented beautifully and worthy of being photographed. If your customers are holding smartphones (and don’t they all! ), get your waiting staff to help them take photos of their food and their group using their phones. Encourage customers to “Like” your restaurant by creating a Facebook Check-in tag for your business and writing it on your menu or chalkboard. Sharing your WiFi password can help too! Encourage customers to write (positive) reviews of your restaurant on Facebook and share their pictures online. Create a name hashtag (such as #PetesPizzas) for customers to tag when they share pictures on Instagram and Facebook. Create an account on a review site – we recommend TripAdvisor for the tourist trade and Yelp! for local customers and invite your regular customers to write positive online reviews. Even if you don’t understand how these things work, your social media savvy customers will! It is part of 21st century life that customers want to share all their experiences online, and if they are doing so it might as well benefit your business! One tip about negative reviews: If customers write something nasty about your restaurant, you can ask them to take it down and offer them a free dessert or a voucher for a future visit. We all know that customers have the right to complain, and as long as most of your reviews are positive, a few negative comments will not harm your business. Try to placate customers before they go online with their complaint. Customers who play the Spin To Win Diners App in your restaurant will want to tell their friends that they have won prizes for future visits – it’s part of the sharing culture. When you join the Spin to Win Diners program, we will give you special graphics to share on social media to announce that you are offering great prizes using the Spin to Win app. We will also announce on our Facebook and Instagram pages that your restaurant has joined our program. We will even run an advertising campaign in YOUR local area to help promote your business. Find out more about the Spin To Win Diners App and how it can help your business to get more shares and likes!